Dungeons & Dragons Nolzur's Marvelous Miniatures come with highly-detailed figures, primed and ready to paint out-of-the-box. Fully compatible with Acrylicos Vallejo paints, these fantastic miniatures include deep cuts for easier painting. The packaging displays these miniatures in a clear and visible format, so customers know exactly what they are getting. This is a 2 count character pack which includes a high and low level miniature of the same character. 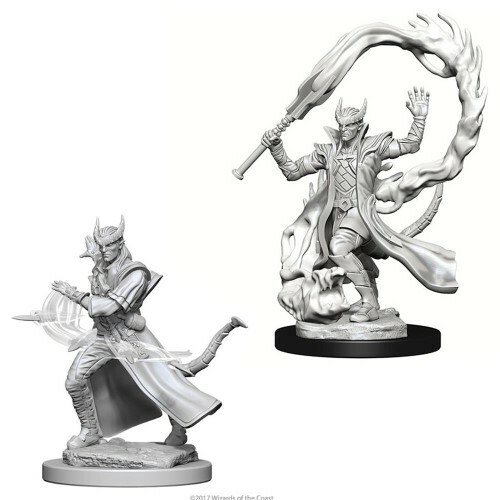 Manufacturer: WizKids Model: D & D NMU: Tiefling Male Sorcerer W4 MPN: WZK73201 UPC: 634482732014.